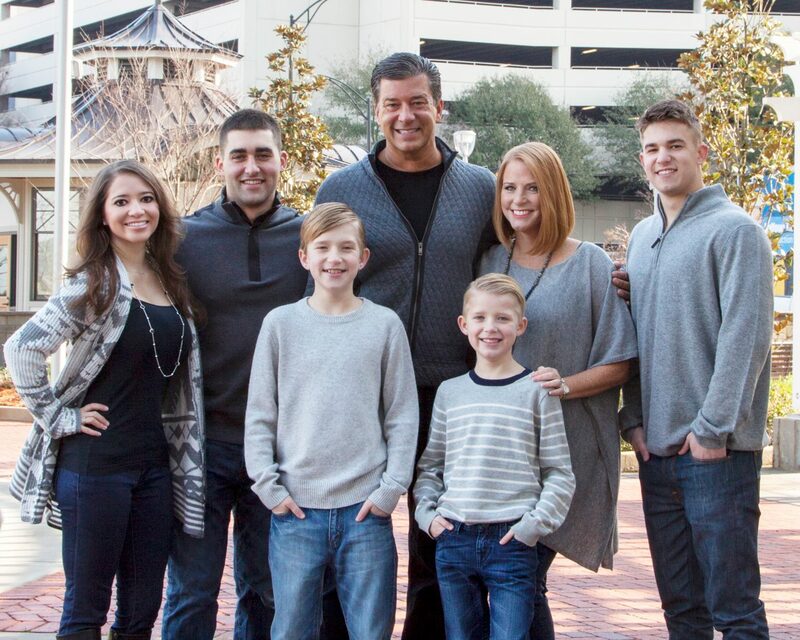 I have been honored to raise a family of four boys alongside my wife, Shawntel. Together, we have worked to instill in them the values we believe are most important in life: how to care for others, the importance of hard work, have a positive attitude, appreciation for what we have, and so many others. Beyond being a good person, I believe these lessons have a direct impact on the level of success you will experience in life. As a business leader and serial entrepreneur, my ability to be a strong and effective leader has played a major role in my success. Leadership is one of those skills that is best taught by example. I was lucky to have in my great examples in my parents growing up and have worked to be a positive example for my children throughout their lives. It starts with a lesson my parents taught me from a young age: to have anything in life, it requires hard work. If you are striving for that promotion, saving for date night, or studying to get into your dream college, everything will require dedicated time and effort. But hard work is about more than just the time you put in. It’s about persevering through the setbacks. This includes one of the most difficult things about being dedicated to your dream: embracing the “No.” Learning to look at each “No” as progress instead of a setback is challenging emotionally and logically. However, reframing the “No” into a step closer to the right “Yes” will enable you to eliminate the fear associated with rejection. The “No” is not failure, but a learning moment. It is through these moments that success is possible. This is a vital step in becoming a strong leader. The second lesson my parents taught me was the importance of a positive attitude. If you go through work, life, or your relationship looking for the next roadblock, the next reason to quit, the next unfairness, you will find them strewn about your path in abundance. There is no one who can look at the world through this frame of mind and find success. Instead, you must have a positive attitude that appreciates and recognizes the small (and big) wins, the strokes of luck, and the hidden opportunities. Leaders who inspire their teams are able to visualize success and share that optimism to create a contagious positive attitude throughout their company. When I look back over my career, it was these two foundational leadership lessons that have enabled me to find success. I have learned to exemplify these skills in the face of challenges and the “No.” I have learned to focus on the vision and keep a positive attitude throughout and use that to inspire my team. This experience is what I used to teach my children the same values and leadership skills throughout their lives. In fact, this is not the first time I have written about the specific actions my wife and I take to instill this into our children. I have written in other blogs about our Red Plate Dinners and the importance of individual recognition and appreciation. I have written about the importance of the search for knowledge and desire to know yourself and those around you, through our Dinner Questions tradition. And I have written about the business trips and money management lessons that enable our children to understand business and personal ownership early on. These are just a few of the specific actions that my family has incorporated into raising our children to be strong and moral leaders. However, there are opportunities every day to teach leadership through example and storytelling. That simple question, “How was your day, Dad?” is an opportunity to teach through a true experience that occurred that day, either in business or personal life. Whether a challenge or success, these stories help our children learn about relationships, business, problem solving, and how to have a positive attitude in the face of adversity. We believe that a commitment to openness and honesty provides insight to real-life challenges that adults face throughout their careers and lives. It is likely that one day one of our sons will find himself facing a similar challenge and will be able to recall how his parents handled it and use that knowledge to make the best decision. They will learn daily how to deal with difficult life experiences. We are so proud of our children and the success they have achieved already. I have seen them carry these lessons out in real life, whether it be in school, golf, baseball, work, or with friends. They are able to process and understand and work through complex problems with a positive attitude and a drive for success. My oldest, Braden, has navigated his career path and has stayed committed to his passion for his own life while achieving success, despite unexpected challenges and the “No.” I see it in him in the way he interacts and supports his friends and how he is supportive and loving to his wife. Each of my children will take a different path and each will encounter challenges and successes. I am proud of the paths they have taken so far and excited to see their continued success as they grow. My wife and I will continue to share with them our life experiences and how we will handle each one. And, knowing my children are growing up to be strong leaders, I too, will listen to their stories and experiences and learn from them because, after all, the final lesson in being a strong leader is knowing when to be humble and learn from those who are wiser than you. THE MOST IMPORTANT THING WE CAN TEACH IS JESUS CHRIST AND ALL HIS WAYS IN THE BIBLE AND BEING FILLED WITH THE HOLY GHOST AND BEING BORN AGAIN IN WATER AND SPIRIT OF JESUS CHRIST! IF WE DONT HAVE JESUS WE HAVE NOTHING JOHN 15:5 JESUS SAID WITHOUT ME YOU CAN DO NOTHING. AND I AM SO GLAD I KNOW JESUS CHRIST AS MY PERSONAL LORD AND SAVIOR NOTHING IS MORE IMPORTANT THAN JESUS AND MY PERSONAL WALK AND PUBLIC WALK WITH HIM ALWAYS IN JESUS THATS WHAT I WOULD TELL MY CHILDREN ALL THE TIME AS OFTEN AS NECESSARY ALWAYS!